I’d been stressing for months over the launch of this book, so when the day finally came… naturally I was terrified by what may or may not happen! Luckily for me, I had already setup emails to go out at scheduled times to several different groups and Amazon had already pressed the golden button to make the book FREE for 2 days, so there was really no looking back. One deep breath at a time, I made it through the day. Trying to focus on running the Workamper Rendezvous setup and making sure everything was going to run smoothly for the big event, the thoughts of failure on two accounts ran rapidly through my mind! 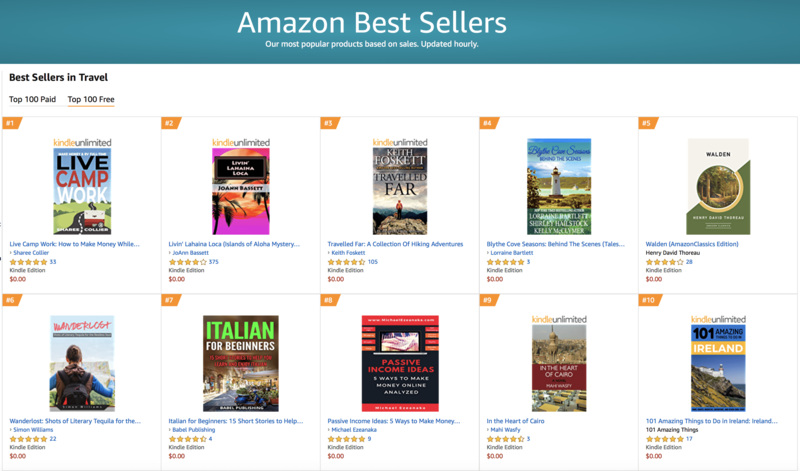 Goals sometimes seem impossible to achieve… like when I decide I wanted to publish a book by my 33rd birthday and have it hit #1 Best Seller on Amazon. It was big goal, a huge goal to be perfectly honest- but I wanted it sooooo bad! Blogs are fun to write and give you an outlet to talk to different people from around the world who love the topics your interested in. But books establish a new level of credibility and to say that your book did well, and ultimately have the orange #1 Best Seller badge next to it on Amazon- is a big deal! This was my goal when I started composing Live Camp Work! I’d been writing about Workamping since the very start of my family’s road trip. Workamping was out ticket to travel and I knew it could help so many others. After working 3 years as a traditional Workamper and then the last 2 behind the scenes for Workamper News– I knew it was time to write the book, so many RVers were looking for. People need a concrete guide on the ins and outs of the lifestyle and I just needed to pen to paper to make it happen. The book was free starting at 12am, when literally not a sole would buy it. I would have loved to pick the start and end dates of the free promotion, but you have to play by. Amazon’s rules- so that’s out of the question! I set up auto emails the night before, to go out to a few different groups including the incredible team of Workampers who participated on my book launch team, the people who were unable to participate but wanted to know when the launch happened, those who entered my free before it hits Amazon contest (but didn’t win) and also a large group of Workamper News members- who I specifically wanted to be able to grab the book during the free promotion. The downloads were already in full swing by the time I checked my report at like 6am CST, but once the emails started going out, things really stepped up a notch! Overall for the day, I had 1692 ebook downloads and 2 paperbacks that were shipped out. 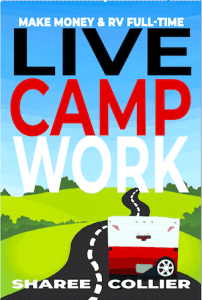 Live Camp Work hit number one in several free categories including Road Travel Reference, Senior Travel and Auto & RV Travel! I was already excited- but you don’t get a badge for free- so I needed to keep going! I compiled a quick last chance email to let everyone know the book would only be free through midnight and placed a blurb on the Workamper Hotline as well. Many of the attendees at Rendezvous were talking about the book, and Win Semmler, one of our presenters announced my birthday to everyone while I was out of the room- which led to more downloads and birthday magic!!! By midnight, I had another 1465 downloads and 3 paperbacks shipped out! 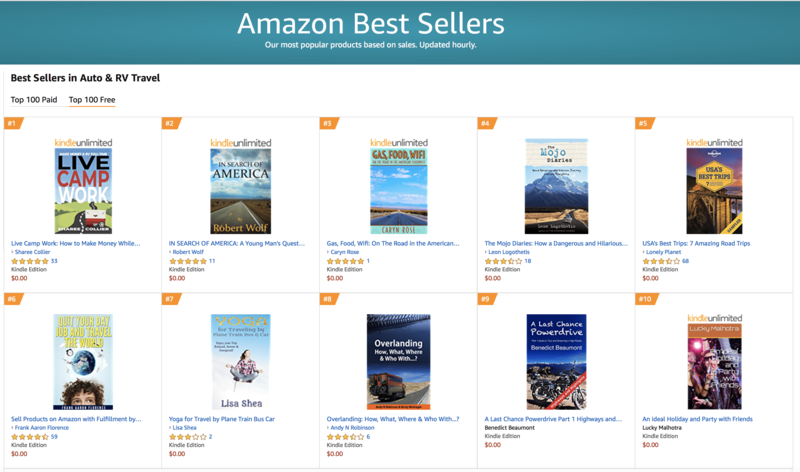 Live Camp Work was maintaining the top spot in many free categories, and to my surprise was now the #1 in all free Travel Books and the #3 Free Non-Fiction book on all of Amazon! I didn’t want to jinx it, but I felt like with these stats I would get the badge. I’ll just be honest. I couldn’t sleep much! I set my alarm for 3am. I woke up excited to check my ranking… nothing. I was so excited I couldn’t go back to sleep and checked my rank again at 4am… nothing. I fell asleep for about an hour and woke up to a blaring alarm at 5am to check again, and there it was!!! The orange best seller badge in 3 categories!!! Woo Hoo! I was so excited I spent the next hour celebrating and taking screenshots in case it didn’t last long! lol. Birthday goal accomplished! I’m so excited to see my book doing well, and I’m so thankful for all team of folks who helped me get it there! This book really was a labor of love! I enjoy talking to people about Workamping and providing information for those who wish to do it now, later, or somewhere in the future! Writing this book on a topic that sits so close to home made it special and easy for me to be authentic. Although I don’t claim to know it all, I’ve been able to provide (at this point) a several thousand people with a resource they can read and refer back to for information on the Workamping lifestyle and employers who hire RVers!